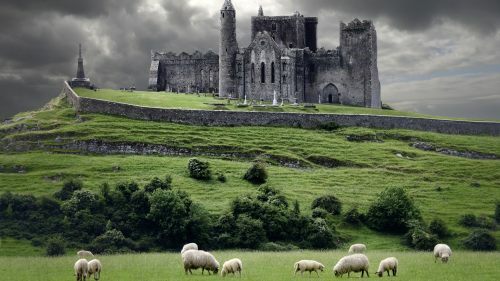 WestJet is selling some of their flights from Vancouver to Dublin, Ireland for just $570 CAD roundtrip including taxes, and there are even summer dates available. Dates over Labour Day and Thanksgiving in September/October are also available. For longer trips, try mixing and matching the departure and return dates from above. Many of the flights involve 2 stops, although the overall travel time is fairly decent. 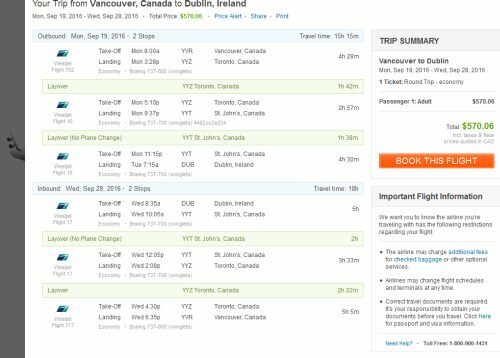 15 Responses to "Vancouver to Dublin, Ireland - $570 CAD roundtrip including taxes | summer 2016 dates available"
...so far FlightHub does not come up with any flights and the WestJet site doesn't have any of these great prices. Technical issue maybe? Great price, thanks. Checked accommodation prices, etc. Who knew that Ireland has overtaken the UK for being a rip-off, and with less stuff to see. Baffling. All booked for Aug.....Yiiipppeee! thank you so much! Susan: They're still showing up on FlightHub, as of 8:10 PM PST. The WestJet site will not have this price. This isn't unusual, and has happened in the past with these WestJet flights to Dublin. Which dates were you trying when you couldn't find the flights? It helps to know, just in case the dates you were trying have sold out, or maybe have just 1 seat left. Can you put a stopover in Toronto for a similar price? It looks like all the prices are back up this morning. I didn't get any of date combinations this morning. Thanks a lot, Chris. :) Love following your email subscriptions. My roommate and I booked our trip last night! We took the $565 flight, because we're down for the 15h stopover in St. John's Newfoundland, we're excited for the day trip, but even more excited to be in Europe and do a little bit of country hopping! Nice! Have a great time in both Newfoundland and Ireland Hannah! Tks from us too, Chris. My partner gets to go home and visit his family, too cool! Is there some sort of day long tour in Newfoundland that Hannah (above) is talking about? Did I miss something somewhere? I think Hannah was just referring to checking out St. John's during her 15 hour stopover. It was possible to book flights that had a really long stop in Newfoundland on the way there. just booked for a friend and I for August. It wasn't the $570 price because things seem to have gone up since then and I just saw this now...but I wanted to thank you anyway! LOVE this site and have used it to book several trips now. You are a gem! Thank you! Thanks Kristal! Have a great time in Ireland!